In June this 2014 ESPRG (Environmental and Social Planning Research Group) of the Queensland Australia, Sri Lanka Water Partnership (http://lankajalani.org/), University of Moratuwa-Sri Lanka (http://www.mrt.ac.lk/web/), and the Sri Lanka Foundation (http://www.slf.lk/) co-organized a policy discussion forum on urban environmental planning in Colombo (Sri Lanka) – held 10th of June, 2014 in Colombo, Sri Lanka. The main aim of the event was to build a discourse on current urban environmental planning challenges and urban ecological transformations in Colombo and South Asian cities in general. More than thirty high level policy makers, environmental activists and reputed academics took part in the discussion. 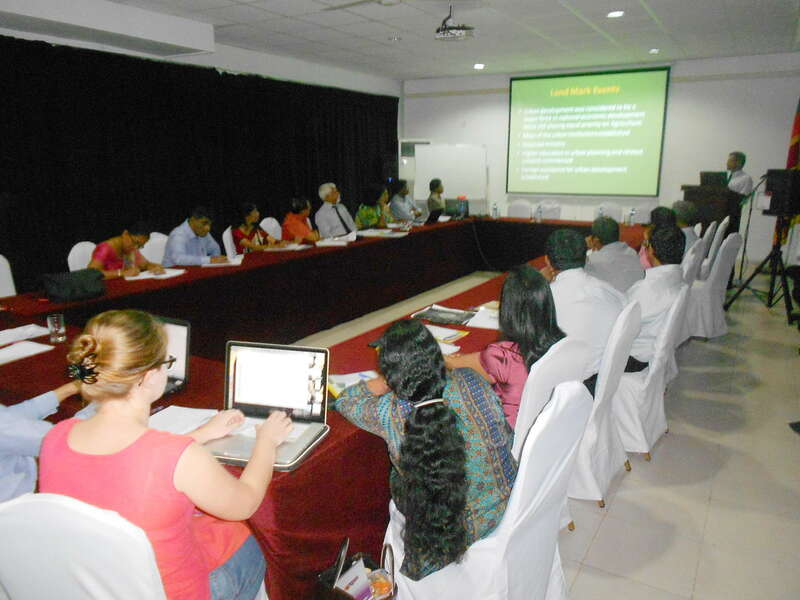 The discussion mainly focused on the rapid degradation and loss of the urban wetlands in Colombo. The event was co-chaired by the Director of the National Science and Technology Policy Secretariat (Sri Lanka), Prof. Ajith de Alwis and the renowned environmental lawyer Ms. Ruwana Rajapakshe (PC). Being a human managed ecological system for more than 500 years the urban wetlands of Colombo are intricately bound with the urban social processes. The rapid urbanization and modernization trends of recent decades have triggered unprecedented ecological transformations in this wetland system resulting in major ecosystem service losses and increased urban floods. These issues were discussed in various perspectives: urban planning, landscape architecture, urban ecology and urban sociology. The Additional Secretary to the Ministry to the Ministry of Defense and Urban Development (Sri Lanka), Mr. Rohan Seneviratne presented the Sri Lankan Government’s 2020 urban development vision for Colombo, which entails major infrastructure development, drainage and waste management projects. Two renowned urban and landscape planners Mr. Hemantha Jayasundara and Mrs. Shareen Amendra did presentations on the historical evolution of urban planning in Colombo. The discussion that ensued highlighted the importance of viewing the city as a complex system with both social and ecological components. Understating of the changing nature of ecological components and importance of incorporating adaptation strategies into the urban planning process was pointed out by Dr. Jayampathy Samarakoon (regional consultant to IUCN). This was adopted as a main recommendation of the forum. It was also pointed out by the discussants that urban poverty in Colombo has many aspects. Although the income-poverty is declining, the vulnerability of the poorer urban communities to disasters and other impacts of environmental degradation are increasing, Karin Fenando from the Center for Poverty Analysis (CEPA) elaborated. Missaka Hettiarachchi from (ESPRG Uni of Queensland) argued based on his recent research work on Colombo that social justice should be a central pillar in urban environmental planning in any developing nation. The forum identified the urgent need to develop strategies to incorporate ecosystem complexity and social justice into current rigid and hierarchical urban development policy processes in Colombo and similar cities in the region. However, the practical challenges in bringing such consensus among diverse disciplinary and bureaucratic factions involved in urban policy making was demonstrated by the stark disagreements that emerged among stakeholders in this discussion. The event was funded jointly by the University of Queensland (UQ-CSIRO INRM grant program) and the Sri Lanka Water Partnership.